Acne Scar Vitalizer Treatment: Improve your Acne Scars Through One Treatment by Dr. Philip Young Bellevue Washington: The Acne Scar Vitalizer Treatment is another way of decreasing the number of procedures you need to do to improve your acne scarrring. If you look at the before picture in the images here, you will see box car scars (depressed scars with a larger surface area) and ice pick scars (depressed scars that are more pinpoint in appearance). With traditional approaches, you need to treat each area with multiple excisions, subcision and deep chemical peeling. After getting the scars to look more like the surrounding unscarred skin, I would then consider something for the superficial layers of the skin such as resurfacing. 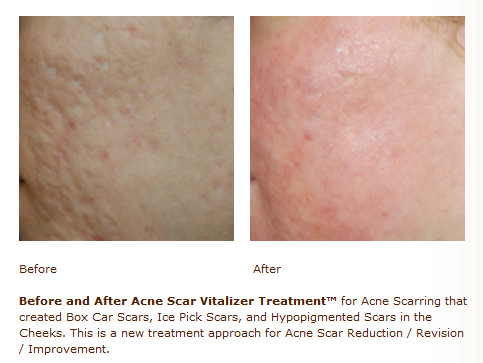 The before and afters show the results from just one procedure, the Acne Scar Vitalizer Treatment. This approach could transform acne scar treatment. This entry was posted on Sunday, July 15th, 2012 at 6:33 am	and is filed under Acne Scar Treatment, Scar Removal / scar reduction / scar revision / scar treatment. You can follow any responses to this entry through the RSS 2.0 feed. Both comments and pings are currently closed.